Now that we have negotiated the political and legal furore of the last couple of days, we can look ahead to this weekend's Singapore GP. It is the second new circuit of the season, a street circuit and much anticipated as the first ever F1 race to be run at night. That is a lot of firsts and it would be easy to become enthusiastic about it were it not for the disappointment that was Valencia. I wrote two posts on the Valencia GP, one before and one after, and they were pretty optimistic. The truth was that, regardless of how future races at the circuit pan out, this year's was the sort of monotonous procession that F1 produces at its worst. 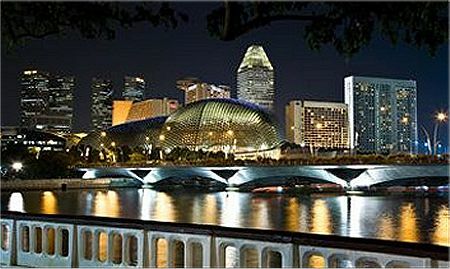 Having proved totally wrong in my expectations of Valencia, I am now hesitant to get too excited about Singapore. It does have a lot going for it in theory, however. The setting, as typified in the photograph above, is entirely more impressive than Valencia's dusty industrial backdrop. Its century-old Anderson Bridge, over which the cars will race, looks to be much more of a landmark than Valencia's ultimately nondescript bridge over the harbor turned out to be. The circuit is considerably tighter than Valencia's too, and is expected to be more akin to Monaco in that respect. Add to that the drama of a night race and it seems that we could be in for a treat. My caution leads me to doubt that much of this will matter in the event, however. The city is undeniably spectacular once night has fallen, but how much of that will we actually see once the race has begun? It may be that the cars will be racing in a tube of light cast by the much-vaunted new lighting system and that any backdrop will be lost in the blackness beyond. And the circuit configuration becomes less interesting when we realize that it is almost totally devoid of gradient. These two factors may seem irrelevant to the quality of the racing but they have an important part to play in our perception of any circuit. Would Spa be our perennial favorite were it surrounded by featureless desert rather than the forested hills that encompass it, supplying the atmosphere with that misty dampness that is always the threat of rain? Monaco, too, would be the ridiculously impractical circuit that it is sometimes accused of being, were it not for the aura of old time splendor provided by the Mediterranean architecture, the blue harbor studded with the bright, white yachts of the rich and famous, the steep gradients and familiar bumps known to such greats as Fangio, Moss and Clark. To compare Singapore to Monaco is hoping for a lot, therefore. It may be similar in configuration but its character is modern and bustling with international commerce, in contrast to the old world grandeur of the Principality. This would be its claim to fame, if the skyscraper setting is able to defeat the brightness of the circuit lighting. The lack of gradient is worrying, too. Steep inclines make all the difference in endearing a circuit to racer and fan alike, as evidenced by the Corkscrew at Laguna Seca, a circuit unremarkable for its setting but beloved by all for that one fabulous, swooping dive down a sudden and unexpected cliff. 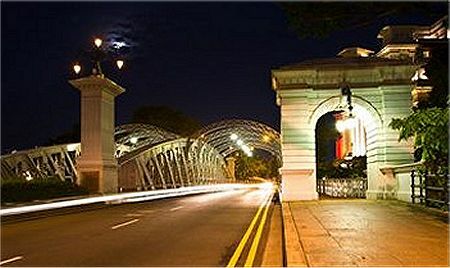 Without a distinguishing feature such as this, Singapore must hope that its night-time setting will provide the drama and interest of a classic race. Feeling amongst the drivers themselves is mixed, some hoping for a considerably more eventful race than we saw at Valencia, others suggesting that it will be yet another procession. We must hope that the optimists are right this time, for the sport hardly needs another circuit that discourages overtaking and close competition. Singapore has a tall order to meet, I think. Of course, if it rains, all bets are off; that will confound all my speculation and we will find out how the combination of bright lights and spray can turn a race into a lottery. spot on again. i noticed on one of the sims that the track is pretty flat and is going to be a surprise only if it isn't a snooze. night races always just look wierd to me anyway and one of the perks of having asian races has always been when it's day there, it's night here and i don't have to crawl out of bed before the sun is up. well, so much for that theory this weekend. i'm really just not looking forward to this one much. i haven't really looked at the programming-are they running quali under the lights, too? I wouldn't hold your breath if I was you. This year MotoGP had it's first night race at Qatar and it was very similar to an average MotoGP race, just the same old circuit but with enough power to run a small country, you couldn't see anything much except of course the circuit itself which was light up inch to inch. The only real difference is the temperature problem of the tires that should be expected with the track being colder. They have changed the timings so that all sessions run in the dark. Initial FP1 and FP3 were to run in daylight but now they will start at sunset so the backdrop could be spectacular. For me 23 corners in 3 miles means fild spread and boring races. This is Valencia with a glittery back drop. When DC in his ITV-F1 says Singapore doesn't flow as well as Valencia you know you are in trouble. I also watched the Moto GP and it was quite clear that the reason for night races is reflective trackside advertising. The sponsors get a lot more bang for the buck and no doubt pay more as well. The tyre heating thing is interesting. How hard will Ferrari be hit by this. Is it possible we could see them dropping out of the points. If they did would night races be dropped straight away? Street circuits should be something we read about in the history books. We need more long flowing tracks like Spa or Suzuka. Instead of encouraging people to builed to the 2.5 mil minimum length new tracks should be encouraged to run to 4 to 5 miles with a maximum of 18 corners(preferably fewer). Then we will get better racing. On the bad side, will anyone be able to recognize the stewards in the dark?? They have a lighting system for the steward's "flags" at Singapore too, Nick. Could be a calamity if someone presses the wrong button on that one! Interesting points about the tyres. It's almost certain to disrupt Ferrari and Williams (they've performed even more poorly on the same circuits as Ferrari have). I'd say it'll be a McLaren walkover, and having seen the sim video on Keith's blog, I agree with Clive and DC. No flow, no gradient, just lights. In short, boring. Pray for a wet but drying track to give it some oomph. Oh, and thanks Bernie. Try your best to destroy the British GP, then make everything else in the world suit the Empire. More wee hours viewing for us Colonials! It seems that I am not alone in my doubts. I do hope that the idea works, however, even though I have argued against night races in the past. At least this is not another designer circuit placed arbitrarily in a desert somewhere. I like street circuits, although I recognize the sense of Steven's suggestion that we need more flowing and longer tracks. Three street races in a season would be just enough to spice things up a bit with their tendency to give lesser teams a chance of winning. The matter of heating the tyres is interesting, Pootle, especially as Ferrari is one of the teams that struggles on this score. With the championship as (artificially) poised as it is, the last thing Ferrari need is a track where they perform poorly. After their performance of late, Nick, I would expect the stewards to be grateful for a few dark corners to hide in. I can't imagine that they will be the most popular of dinner guests at the moment. The reasons for night racing demonstrate clearly that the FIA's courting of Asian countries has been about money and nothing else. It is all about TV viewing figures in Europe, the very continent that is being stripped of its GP circuits so that rich countries in the East can pay ridiculous amounts of money into Bernie's coffers. The fact that Bernie then hampers the development of a fan base in those tiger economies by insisting on night races shows clearly that he knows where the great majority of the F1's fans still live. It is insulting to those who live in countries outside Europe and Bernie should be told loudly and clearly that European fans do not mind getting up early in the morning to watch races - indeed, for many, it is part of the enjoyment to be able to watch in peace while the rest of the family sleeps. I have to say I don't always get up early to watch the races anymore. Recent "activities" have dulled my interest a bit. As for Singapore, the little teams don't have a chance. Barring the odd DNF (which are becoming more and more rare) Quali will decide the race. Very few street races offer any chance to pass, and very few of the current crop of drivers seem able to create an opportunity for themselves. It comes down to we'll get them in the pits. Bleah!! Until I saw the Kubica drive around on Keith`s site I had high hope`s(RIP Richard Wright you wont be forgotten),but now I`am not so sure,the last third is something out of a Go Kart Sim,turns 1 aqnd 7 as pointed out might lead to overtaking but the whole thing stinks,the left/right after the bridge is surely something out of Mario Kart,but I hope I`ll be here Sunday night eating humble pie while putting my hat in the oven,but if this is the future Bernie has set out for Formula 1,it will surely be the F1 circus.But,and this is a big but(fnaw fnaw)if it rains we might get a Panis winning at Monaco sort of race ,Mansell spinning on `that white line`or maybe Senna at Donnington,but one thing is for sure it will be nothing we can predict,because thet is the beauty of Formula 1(something Bernie and Max have lost in there battle for control of the known Universe)...Oh sorry but nearly forgot...Good Luck and God Speed Shenzhou 7.....cant wait till they build F1 Cars. Glad to see I am not the only person on the planet taking an interest in Shenzhou 7. The shortness and flatness of tracks alone are not a detriment (Canada) but I think what's disappointing, or setting up disappointment, besides how poor Valencia turned out after the hype, is that the city lights and suspension bridges alone are expected to supply the character. Now, from the clip on Keith's site, I think the difference between Singapore and Valencia is obvious: the possibility of invisible, torrential rain. We'll just have to see what happens. There`s only one thing more beautiful than an F1 Car,and thats the Space Shuttle. NASA have two shuttle on the pad being prepared just now. First launches Oct 14th to the Hubble telescope and the second goes to the ISS about 4 weeks later. Can't ever remember two shuttles being on the pad at the same time. Full mission coverage including the unmissable launch and landing on NASA TV.